The wait is over – the highly anticipated WebUI Studio 2012 SP1 release is now available for download. Grab your copy here. 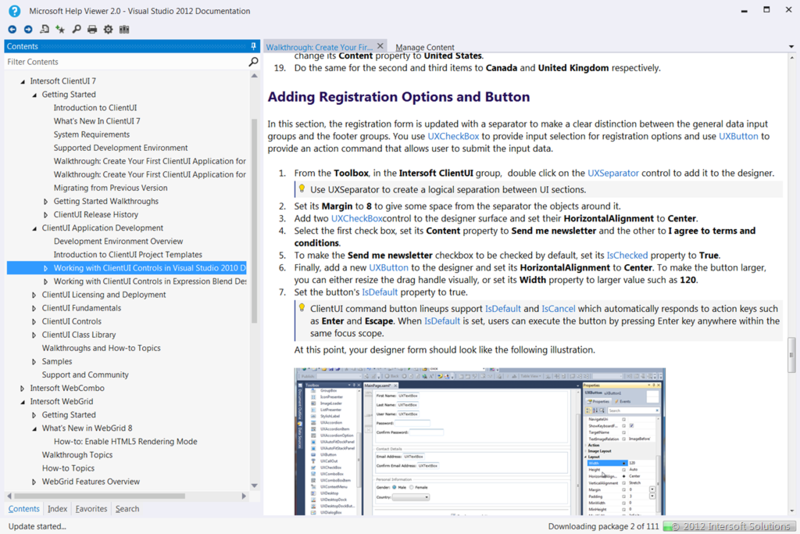 As mentioned in my recent posts, the new service pack release includes full support for Visual Studio 2012 which updates all 40+ component designers to adhere the Visual Studio UX guidelines. In addition, this release has been optimized for Windows 8 as well as support for Internet Explorer 10. For details, check out my post here. Even more, the new service pack ships dozens of new features and major performance improvements to the Silverlight and WPF controls, ranging from the ribbon controls, all variants of selection controls, smoother animation in expandable group box, attribute-based licensing mechanism, and much more. For complete details, make sure you check out the Release Notes document once the service pack is installed successfully. In addition to a host of designer-related enhancements, this new release also automatically plug all products documentation into Help Viewer 2.0 which shares the modern Visual Studio interface. The look and feel of the documentation content has been updated as well to share the same metaphor, see the shot below. Everything you need is here. And whenever you need help, simply press F1 and locate the topics in the new Help Viewer. Along with this release, we’re pleased to introduce a new page dedicated to Visual Studio 2012 which contains related information and resources. Check it out at intersoftpt.com/vs2012. Last but not least, enjoy (Visual + WebUI) Studio 2012! Here’s the download link again in case you missed it. Did you by any chance provide Metro styles for your Client UI controls? This is something that is desprately missing. We aren’t focused on Metro styles in this release. We’ll be going full scale on Metro so it’s going to ship in the upcoming R2 roadmap.